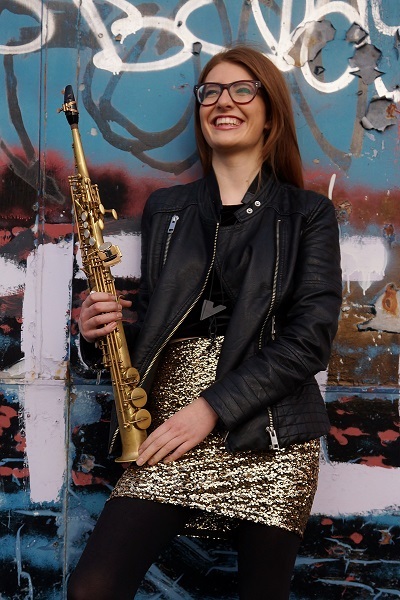 18 year old saxophonist Jess Gillam from Ulverston began playing saxophone aged 7. In 2016, Jess made history as the first ever saxophonist to win the Woodwind Final of BBC Young Musician of the Year. She then reached the Grand Final and performed a concerto with the BBC Symphony Orchestra at London’s Barbican Hall to critical acclaim. Jess was recently awarded Musician of the Year at the Cumbria Culture Awards. Where are you studying at the moment? I am currently in my first year at the Royal Northern College of Music in Manchester. I am taught by Rob Buckland and I am also mentored by John Harle. What instruments do you play? I play soprano and alto saxophone and I also play clarinet but quite badly! How and when did you first become interested in music? I started playing saxophone 10 years ago, when I was 7, at the Barracudas Carnival Arts Centre in Barrow. My dad taught drums there twice a week and there were also dance and stilts workshops. I went along with him and saxophone workshops were on offer so I thought I would give it a try. I picked it up, made a sound, and have absolutely loved it ever since! What’s the best thing about being a musician? For me, the best thing about being a musician is having the chance to perform. I love performing and the whole experience of a performance – from the many hours of practice, research and listening to the moment of standing on a stage in front of an audience. Giving a performance is an electrifying experience and one of the greatest sources of joy! What’s your most memorable musical experience? I have so many memorable musical experiences so it is quite difficult to choose one! However, performing the Michael Nyman Saxopohone Concerto with the BBC Symphony Orchestra at the Barbican in London for the BBC Young Musician Final was absolutely unforgettable. Another of my most memorable concert experiences is making a guest appearance with Jools Holland and his R+B Orchestra. I had absolutely no idea what we were going to play until 5 minutes before stepping on stage! This made me quite anxious but once we had started playing, I couldn’t have been happier! Just this weekend, I was performing in Canterbury with John Harle and Marc Almond + guests and this was one of the best experiences I have ever had. Do you have any other interests? I have a passion for promoting live music in my hometown of Ulverston. I run a concert series and artists such as Courtney Pine, Snake Davis, Tommy Smith, Apollo Saxophone Quartet and John Harle have performed. What are your top tips for other young musicians? I think to enjoy music is the most important piece of advice I have been given. It makes the hours of practice an absolute joy if you are enjoying being inquisitive, determined and passionate about attempting to master an instrument! Aiming to convey a personal interpretation of a piece of music is also important I think. Music is one of the most powerful forms of communication and can be used to say an incredible amount.